Moore Industries-Pacific have introduced the STA safety trip alarm that is suitable for interface instruments for plant-critical IEC 61508 functional process safety applications. The STA safety trip alarm is a part of Moore Industries-Pacific FS functional safety series and is certified to IEC 61508: Parts 1, 2 and 3 by TÜV Rheinland for single use in safety instrumented systems up to SIL 2. The STA firmware is suitable for a SIL 3 system, which allows the STA to be used in a redundant architecture (1oo2, 2oo3, etc.) up to SIL 3. The STA safety trip alarm performs as a logic solver and acts on potentially hazardous process conditions. 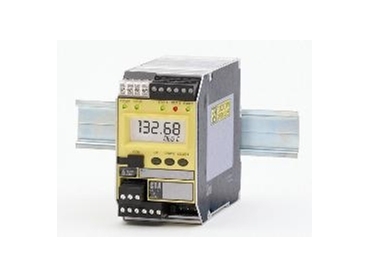 It warns of unwanted process conditions, provides emergency shutdown, or provides on/off control in Safety Instrumented Systems (SIS) and traditional alarm trip applications. The 4-wire (line/mains-powered) STA safety trip alarm accepts a signal input from transmitters (current and voltage inputs), temperature sensors (RTD and thermocouple inputs), resistance and potentiometer devices, and from a range of monitoring and control equipment. The STA safety trip alarm provides three failsafe alarm outputs. Two are configurable process alarms that trip when a monitored process variable falls outside of user-set high and/or low limits. The third alarm is a non-programmable, latching alarm that is activated if any internal faults are found by the STA safety trip alarm internal diagnostics. This fault relay is also triggered if the input is faulty or broken. The STA safety trip alarm is provided with comprehensive FMEDA (Failure Modes, Effects and Diagnostics Analysis) certified safety data to be used by a functional safety practitioner to determine the unit’s applicability as a logic solver in safety-related applications. The STA safety trip alarm features 20-bit input resolution, long term stability between scheduled calibrations, a rugged or industrial metal housing and isolation and RFI/EMI protection that provides higher protection against the effects of ground loops, plant noise, and radio frequency or electromagnetic interference. The unit also features standard ‘transmitter excitation’ to provide 24V power to a 2-wire transmitter. The STA safety trip alarm can be ordered with an analogue output option to provide a combination of alarm trip and transmitter in one unit.